'Cinderella' Cast & Crew Thank You. As a 'Thank You' to the Members who help and support the very successful Pantomime, 'Cinderella', the Management Committee is giving each of these Members a copy of the DVD for FREE. To obtain your 'Cinderella' DVD, please contact Ben Long, Social Committee Treasurer. He can be contacted by email; benlong2607@hotmail.co.uk or by calling 07507572840. Any questions or queries, please contact Sam McCarthy, Chairman, through this website. Thanks. Polite Reminder - To ensure we secure our booking, please make sure you get your deposits of £5 pp to Ben Long by Thursday 3rd Feb at the latest. Ben will be at the start of rehearsals both Tuesday and Thursday this week to collect monies, or is contactable on 07507572840. *UPDATE - Children under the age of 10 years, price will be £9 (£4 for those involved in the concert). To coincide with the Royal Wedding celebrations; it has been decided to hold our spring get together on Friday 29th April. The social committee are planning a sit-down meal with possible disco depending on available venues. If you are interested in attending please contact Edna Mountstephen or email angielong1975@hotmail.co.uk as soon as possible. Once enough interest is shown further details will follow. Please be aware as always this event will be kept to an affordable amount. Hope you can make it. 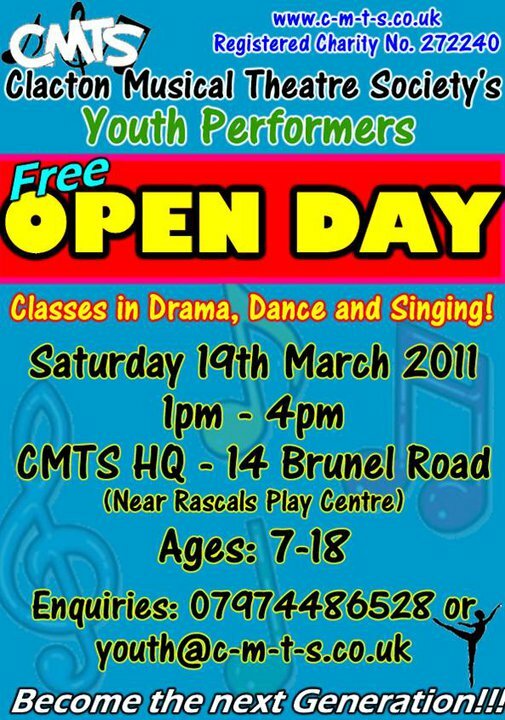 There is a CMTS Youth Performers Committee meeting tomorrow (Tuesday 25th January) at the HQ starting at 1830. Please be aware payment will be required on the day and copies will be posted to you. Green Room will be open! All you can eat buffet and KARAOKE!! Cost: £16pp however for those directly involved with the Concert (ie your name appears in the programme) the Social Committee are subsidising this amount by £5. Please note: The full amount is still payable for any non-eaters. If interested please forward a deposit of £5 to Ben Long NO LATER than Thursday 3rd February. GO BANANAS @ GO BANANAS! Bring out that child in you.... organised fun and games at Colchesters indoor play arena. NB: For this event to go ahead we need a minimum of 20 people. Please place your name of the notice board at the CMTS unit or email angielong1975@hotmail.co.uk if interested. Date will then be confirmed once enough interest is shown. Dates and final details being discussed at the moment. We're hoping to hold this event in April depending on avaliability of venues. Possible ideas include, sit down meal with disco. All those taking part will receive a present, with the person who collects the most easter themed cards receiving a bigger prize. 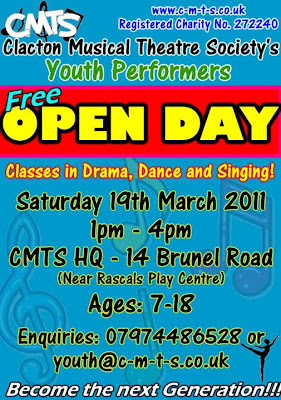 Bring along the kids and grandkids for a great fun-filled afternoon. Please be aware limited number available and will be allocated on a 1st come 1st served basis. To obtain your copy please email or text Ben Long on benlong2607@hotmail.co.uk or 07507572840/07961702828 stating if you would like DVD, Photo's or both. The Management Committee are pleased to announce that the Panto for 2011/12 will be 'Snow White and the 7 Dwarfs'. It will be on at the West Cliff Theatre. The script and the Production Team will now be discussed and agreed. If any Member wishes to put forward a script that they have written, then please contact Julia Hewett, Honorary Secretary, by email. The closing date for script submissions is Monday 28th February 2011. The Management Committee has decided that the Long Service Awards will presented at the AGM's.